Held at the end of August, this was very well attended by representatives of the Affiliate Members and UDAT Directors, Management Group and Staff. The evening started with a very pleasant BBQ in the Sluievannachie car park (right) in Ballater on the banks of the River Dee. This is located by turning left into Braemar Place, off the A93 on the way out of Ballater heading towards Braemar, and then taking a right along Old Line Road. 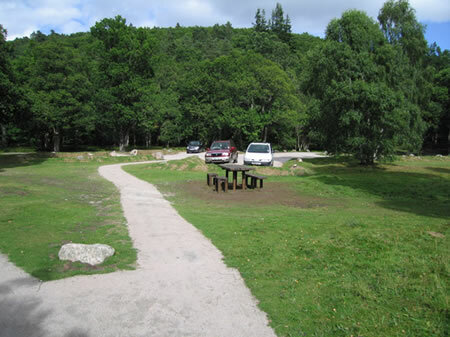 The development of the picnic area and car park has been funded by UDAT and Ian Cameron represented the contractors, Castle Plant (Deeside) Ltd, who undertook the work. After a good supper everyone walked along the UDAT upgraded path following the river before cutting through a bit of open ground. UDAT are planning to upgrade this section of path to make it safe from overflow of the River Dee, and so through the caravan site, to the Monaltrie Hotel. As previously, the Business Meeting was short and formal to receive reports and re-appoint directors and auditor. Following the recommendation made at last year's AGM there was an election of two affiliates to join the Management Group. Alistair Lawson (Scotways) and Ken Thomson (Cairngorm Club) were successful. They face a tough job of providing a higher profile interface with affiliates. 0.3km of the Ladder path on Lochnagar. After a short presentation by the management consultant (and a cup of tea) we broke into small groups to consider how the skills of Associate Members can be harnessed and how to improve Communications. All groups suggested a register of Skills which could help the Project Manager in his work. The meeting agreed that the present reporting is of a very high standard, but nearly all historical. A variety of forms of communication were suggested, but groups welcomed greater involvement in the planning stages. The Trust went through an extensive consultation exercise several years ago, before embarking on the current mountain work. It is probably time to re-evaluate the priorities in the light of completed work and changes on the ground. It was hoped that the new Affiliate Representatives will be able to improve communications between board, staff and affiliates without creating additional work for officers.